The ACLU is often approached by people seeking to understand their rights, and whether they have been violated, in various contexts. Our extensive Know Your Rights resources are meant to provide some answers to those questions. 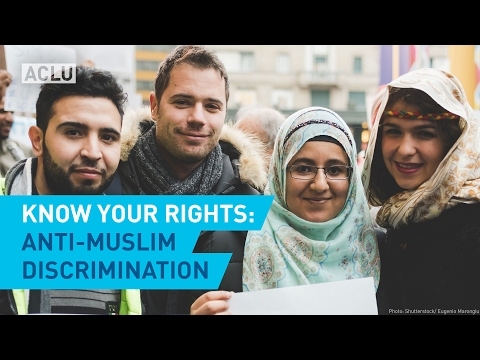 Recently, we have seen a particular rise in instances of discrimination against American Muslims and those perceived to be Muslim. As a result, we have prepared this resource, which relies on existing materials you can find elsewhere on this site as well as at aclu.org. The ACLU has put together printable one-sheets that highlight your rights, which you can find below. Print and share them in your communities. Please note that this information is not a substitute for legal advice. You should contact an attorney if you believe that your rights have been violated.